Seymour Hersh has risked much over his decades of journalism. He is a true journalist who has been attacked, slandered, and shunned by all sides simply because he seems to resist taking any side. When he reported on US atrocities in Vietnam, he was first attacked and denounced as a traitor or worse. In time, both the truth and Hersh were vindicated and the importance of what he did as a journalist to both inform the public and serve as a check and balance against the special interests of ruling power were recognized with a Pultizer Prize. In 2007, when he exposed the then Bush-administration’s plans to use the Muslim Brotherhood and militant groups linked to Al Qaeda to overthrow the government of Syria – the result of which is unfolding today – the New Yorker gladly welcomed his work as a message they perceived would resonate well with liberal audiences. But then in 2013, when Hersh brought forward information contradicting the West’s official narrative regarding a chemical attack on the outskirts of Damascus, the New Yorker decided not to publish it. His report, “Whose Sarin?” instead found itself published in the London Review of Books. The story of Hersh bringing this information forward to the public and how the Western media attempted to first discourage it, then bury it, before attempting to discredit both the report and Hersh himself is a microcosm of the dying Western media. 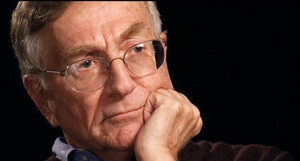 Hersh’s report went on in detail covering the manner in which Western leaders intentionally manipulated or even outright fabricated intelligence to justify military intervention in Syria – eerily similar to the lies told to justify the invasion and occupation of Iraq, and the escalation of the war in Vietnam after the Gulf of Tonkin incident. And not only did the report punch holes through the official narrative, it helped hobble what little momentum was left for Western military aggression against Syria based on the lies told by the US and its allies regarding the chemical attack. In Hersh’s follow up report, “The Red Line and the Rat Line,” also published by the London Review of Books, he revealed information not only further exposing the lies told by the US and its allies, but suggested NATO member Turkey and close US-ally Saudi Arabia may have played a role in supplying those responsible for the attack with the chemical weapons. Should Hersh’s reports reach wider audiences and the idea of a West capable of conceiving, carrying out, then trying to exploit a crime against humanity to justify expanded, unjust war, Western foreign policy would irrevocably be disfigured and perhaps begin to unravel. It would be these – what are essentially government-paid liars – who the West would turn to in an attempt to bury Hersh and the remnants of real Western journalism with him. UK-based unemployed government worker Eliot Higgins began and maintained a popular blog amalgamating online photos and videos from the Syrian conflict. Journalists and analysts from all sides used his resource as a sort of “wartime encyclopedia.” While Higgins possessed no qualifications or background in warfare, geopolitics, or weapons specifically, what he did possess was a great amount of time. In this time he was able to accurately look up and catalog the media on his blog. However, it wasn’t long before the Western media approached him to fulfill the role of “independent credible voice.” Whether Eliot Higgins was the recipient of “secret payments” at that time or not, it is clear now that he was both approached by and sought those willing to pay him for his services and that his work from then on was decidedly both biased and dishonest. Higgins was furnished with his own “weapons expert,” Dan Kaszeta, who either owns or is an associate of multiple dubious “consulting” firms. 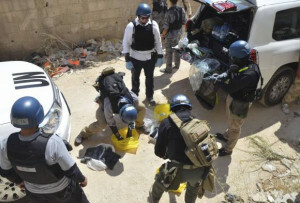 Together from the beginning Higgins and Kaszeta bolstered the West’s narrative that the Syrian government was responsible for using munitions filled with nerve agents right in front of UN inspectors in Damascus. Using what they collectively called “open source intelligence” – watching YouTube videos and looking at Google Earth – they claimed the type of rocket and nerve agent used could only have been deployed by the Syrian government. Hersh contested these claims in both of his reports and in additional interviews pointing out that the rockets were crude and could just as easily be homemade, while the production of nerve agents – certainly the work of a state actor – could have been done in either Turkey or Saudi Arabia or with either nations’ assistance, then deployed by militants in Syria. To this day, the UN’s official conclusion is that there was “clear and convincing evidence” that rockets containing nerve agents were launched at Damascus suburbs – assigning no blame, nor indicating from where either the rockets or the nerve agents originated. Higgins and Kaszeta, featured in the London Guardian and Foreign Policy Magazine, would directly attack Hersh’s claims citing YouTube videos and UN reports as evidence that the Syrian government possessed the type of rockets used in the attack and the type of nerve agent contained in the rockets – omitting one very important question – what if the attack was meant to look like the work of the Syrian government? In reality, all Higgins and Kaszeta proved was that whoever carried out the attack – designed solely to grant the US and its allies justification for direct military intervention – spent a lot of time and effort to make the attack appear as if the Syrian government carried it out. They predicate their entire argument upon claiming the West would not – for some reason – fabricate an attack to justify a war they sought to wage but lacked any justification to do so. While seeking to re-ignite the “whodunnit” debate about chemical weapons, Hersh’s article unwittingly revealed a lot about the changing nature of investigative journalism. Hersh is old-school. He operates in a world of hush-hush contacts – often-anonymous well-placed sources passing snippets of information around which he constructs an article that challenges received wisdom. The Hersh style of journalism certainly has a place, but in the age of the internet it’s a diminishing one – as the web-based work of Higgins and others continually shows. It is a talking point that Higgins himself would again make in the space afforded to him by Foreign Policy magazine – that traditional journalism with real sources is out, and Cass Sunstein’s army of paid “independent credible voices” are in. A Russian-brokered deal that saw the entirety of Syria’s chemical weapon stockpiles removed from the country under the supervision of the United Nations means that there are neither chemical weapons for the Syrian government to use (or be blamed for using), nor chemical weapons left for terrorists fighting the Syrian government to pilfer and use. Yet now along Turkey’s border – the nation Hersh has suggested was behind the 2013 gas attack – terrorists from the so-called “Islamic State” (ISIS) are allegedly deploying chemical weapons. Initial reports indicate the use of mustard gas – a blistering agent. Like nerve agents, the production and deployment of these weapons requires state resources. The Western media, in a bid to explain how ISIS has acquired these weapons, has begun spinning theories that Syria’s weapons on their way out of Syria somehow ended up in ISIS’ hands. The presence of chemical weapons in northern Syria and Iraq indicates that just as Hersh suggested, chemical weapons are being passed on to terrorists operating in Syria from either Turkey or Saudi Arabia, or both. With this recent development, literally years of Higgins and Kaszeta’s lies have been exposed, vindicating award-winning veteran journalist Seymour Hersh and the traditional methods of journalism he employed to draw his conclusions. It also exposes Sunstein’s army of “independent credible voices” as just another facet in the echo chamber of discredited, now widely distrusted lies of the Western media. One might expect a higher degree of professionalism and civilized debate from “experts” regularly deferred to by the Western media not only in regards to the Syrian conflict but also in Ukraine, where Eliot Higgins is now offering his “independent credible voice” to the MH17 disaster. However, admittedly employed by Western think tanks and consultancy agencies, Higgins no longer possess an “independent” voice, and considering his intentional and unrepentant deceit regarding Syria, he no longer possess a “credible’ voice either. Using chemical weapons has never been an effective means of fighting war. Beyond their psychological effects, conventional weapons have proven a vastly superior means of waging and winning war. During the deadly 8 year war between Iraq and Iran, chemical weapons were used including nerve agents. Yet a document produced by the US Marine Corps, titled, “Lessons Learned: The Iran-Iraq War” under “Appendix B: Chemical Weapons,” revealed less than 2-3% of all casualties were the result of chemical warfare.The report concluded that even large scale use of chemical weapons offered little advantage to either side and suggests that attacks carried out with such weapons required almost perfect weather and geographical conditions to be of even limited benefit. On a smaller scale, the use of chemical weapons would be tactically and strategically useless – unless of course used as a means of implicating your enemy and justifying wider war. Likewise, shooting down a civilian airliner over Ukraine offers no benefit to a warring party unless of course they did it to implicate their enemies and justify wider war. Discerning this is a product of critical thinking – which is what drove people away from the Western media in the first place. Sunstein’s mistaken belief that somehow those drifting away from the Western media were as easily fooled as those still watching it is why people like Higgins have ended up chased out of the independent media and back, deeply within the system that co-opted and used him in the first place. For Hersh, he proves that dedication to the truth when it is unpopular is a small price to pay to keep one’s dignity. The ridicule and accusations of those without dignity fades, but the truth is everlasting. When the truth Hersh has pointed out beneath the lies finally surfaced for all to see, vindication exposed people like Higgins and Kaszeta for all to see. With the veils of legitimacy and professionalism yanked from them, they are reduced to vulgar, miniature versions of the rotting system that created them. Without realizing their very creation as “consultants” lies in the decline of those who sought them out, not because of their talent, but because of their willingness to do what those with dignity refuse to do, they will likely go on with their ignoble work. But like the media houses that desperately needed their “independent credible voices” to begin with, fewer will be listening and reading.